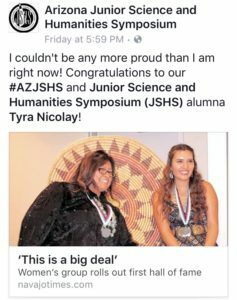 Congratulations to JSHS Arizona alumna Tyra Nicolay! She is one of several tribal members inducted into the Navajo Nation Women’s Commission inaugural Hall of Fame. Youth and elders were selected for “exemplifying moral character while inspiring commitment, dedication, and compassion to improve lives in local communities.” Tyra participated in Arizona JSHS and the 55th adn 56th National JSHS symposia. Read more about the in the Navajo Nation Times.